Ortlieb panniers, front and back, are utilized on this tour. These are called Front Roller Plus and Back Roller Plus. The material is lightweight and strong. These use a lighter-weight Cordura finish, fully backed by a laminate, which is more eco friendly and expensive than the heavier PVC versions. The design is incredibly simple - they're easy to get into and straightforward to shut. 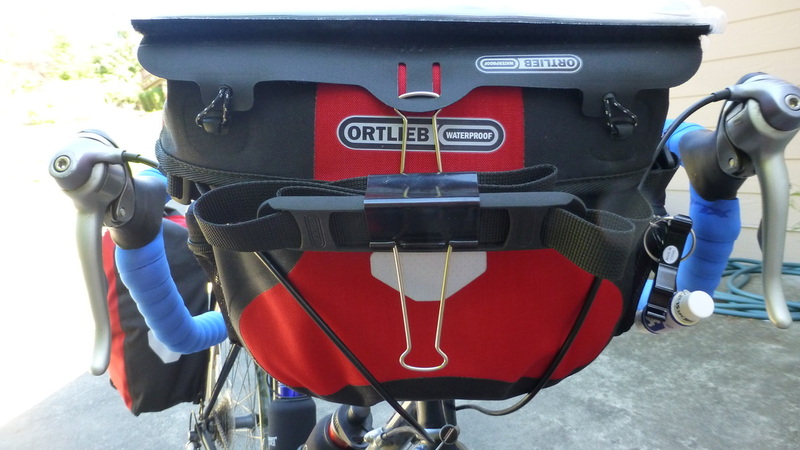 Mounting and dismounting the panniers is very easy due to a clever design used by Ortlieb (QL2 mounting system). It easily adapts to most rack configurations without tools. There are two big reflective patches, an internal pocket and a shoulder strap with each pannier. One their biggest merits is the waterproof construction. The back rollers pack up to 40 liters per pair and the front rollers pack up to 25 liters per pair. The handle bar bag is also Ortlieb to keep a consistent matching look. The Ultimate 6 Plus model is made out of Ortlieb's "Plus" material which has a fabric like look and feel. It is just as waterproof as the classic material so your gear will stay dry no matter what the weather is like. Magnets hold the lid in place so it's easy to open and close it. This handlebar bag can be locked to the bike. The removable shoulder strap will come in handy if you do decide to carry it with you when you are exploring by foot. The biggest advantage of this handlebar bag is that it is roomy (carry up to 6.5 pounds) and is entirely waterproof. An innovative solution to keep the carry straps mounted all the time and out of the way while riding is to attach a big 2-inch paper clamp to the front to hold the folded strap. Note that the paper clamp is permanently attached through the oval loops of the optional map case. See the detail in the picture to the right.